Silus Vesuius's House is the home of Silus Vesuius and a museum dedicated to the Mythic Dawn. 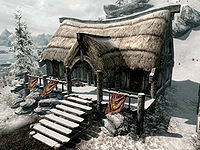 The house is located on the north side of Dawnstar, close to the coast line. It is the last house in the row to the left of Beitild's house. It is inaccessible until you reach level 20. It consists of one area, Silus Vesuius's House. Silus Vesuius' House is a single room house, half the house has been converted into a museum for the Mythic Dawn, while the other half is Silus Vesuius' living area. There are four display cabinets around the northwestern half of the house, with a Mythic Dawn banner behind each. The first three of these are adept-locked, while the fourth can not be interacted with. The first to your left as you enter contains two Mythic Dawn robes, a pair of Mythic Dawn boots and Mythic Dawn gloves. The second display cabinet contains a tattered page of the Mysterium Xarxes. The third cabinet contains copies of all four of the Mythic Dawn Commentaries. The fourth cabinet contains the Scabbard of Mehrunes' Razor, until removed by Silus during the related quest. The southeastern end of the house is Silus' living area and contains a stone fireplace opposite the door with a cooking pot to the right on the hearth with a hanging rack holding three rabbits above. There are several pieces of firewood to the left on the hearth. A wardrobe stands in the eastern corner of the room. There is a double owned bed against the southeast wall and two barrels in the southern corner. There is a small table and chair holding a bottle of wine, a bottle of alto wine, a large coin purse, three carrots, two loaves of bread and two chicken's eggs. If you visit Silus Vesuius's House before receiving the museum pamphlet, the Mythic Dawn banners are not visible. They only appear after the museum has opened. If you use any form of weapon or destruction-type spell on the tattered page of the Mysterium Xarxes, it will transform into an immobile bucket. This transformation is permanent. This page was last modified on 12 February 2015, at 07:08.